The Hebrew Calendar year 5779 is the Roman year 2019. Ayin was originally associated with "eye". God has been getting us to see what we can not see: the invisible, angels: recognition of spiritual warfare. 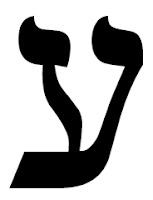 Ayin (70) also means, "end of captivity", "empowerment", or "release into ministry". Tet means "womb", or "wineskin". Words for "good" & "pure" are "tet" words: clean, pure, purity, cleanse, purify, clear, and splendor. Words for impure & defiled are "tet" words too! : defiled, impure, to soil, defile, dirty, and sink down into mire. This is an important year to learn discernment. Good and evil, pure and impure. The picture of Tet is also a picture of a snake. If you don't submit your life to the King, the snake is waiting to overtake you (this year). 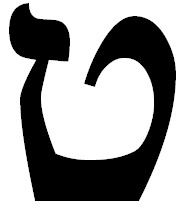 Tet = womb and Ayin = vision. "The vision God has given you is in your womb. This year, it is time for that vision to be brought to birth. Welcome what God is birthing in your life this year." Same for the church. Outpouring of the Spirit, worldwide. This vision has been in the womb of the church and will be brought to birth this year. It is time for a new movement. Ayn + Tet = Vision for new wineskin. New wineskin: Apostolic Church, Saints' Movement : been forming, but still in the womb. Will fully manifest this year, so that we can hold the new wine. When you see that symbol... know that it's time for your VISION to come to birth! So... Bow before Him as KING and worship Him! Receive a fresh outpouring of the Spirit! "The new movement has begun!" "For I know the plans I have for you”—this is the Lord’s declaration—“plans for your well-being, not for disaster, to give you a future and a hope." We are on God's side. He isn't on our side. We choose. We just have to show up. We lose by default, when we don't show up. Show up with a sincere heart, and make an honest effort to obey him, he's gonna do what he's gonna do. This is a year when God is going to bring forth His life from the barrenness. God is going to hover over those areas and release His glory. Then reproduction, life will come forth. What is coming is more than saving, it will be transformational. Nations are going to change, when Holy Spirit hovers and activates the word. Genesis 1: Holy Spirit hovered and life came. Abraham & Sarah: unable to reproduce. God hovered over them and they got pregnant at ages 99 and 90. 25 year old promise fulfilled. 25 years of barrenness broken. More than a son, but a nation, a redeemer. Transformative event for the entire planet. Exodus 19: God hovered at Mount Sinai. The government of God in you, your house, business. David and the house of God, presence of God. The ark of glory at your house. Isaiah 35 & 40: the glory of the Lord hovers over the desert.